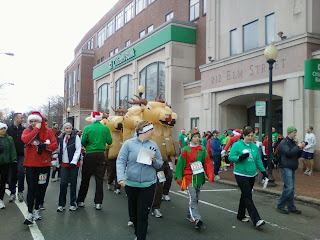 The 2008 Jingle Bell Run was my first running race ever. My goal was to finish the race without stopping to walk. I wasn't really sure what to expect, but it wasn't 2000+ people dressed as Santa, elves, reindeer, and at least one 6' gingerbread man. All of whom flew by me, as it happens, but that was fine. I enjoyed the run and wanted to be part of it again. This year I signed up and knew that friends would also be there. I also wanted to dress for the occasion this time, with a Patriot's Santa hat borrowed from Monica. Rather than take the T or drive, I walked from my house to Davis Square, warming up a bit in the process. I got there around 10:30 and checked out the many costumes and exposed skin; some very brave and/or warm-blooded people. I kept looking for my friends but never saw any of them, so I settled into the 8 minute/mile pen and we started off at the gun. It wasn't a problem the last time I ran here, but the first mile or so is spent trying to find a clear path to run. I had to bob and weave to get past some slower runners (a phrase that still amazes me) as we worked our way to Ball Square, then up towards Tufts. I had warmed up but never really felt loose during the run. I didn't stop at the water station because it was only a 5K, turned onto the bike path, sprinted as best I could while avoiding the ice and finished in 25:47. Without the slow first mile I'm sure I could have been faster, probably under 25 minutes, but it doesn't really matter. After the race I got my medal, grabbed some water and hung around a bit looking for Maria and Jackie, but never saw either of them. So, I walked back home after the race, still wearing my medal, bib, and Santa hat. A good way to spend the morning.